It all started in 2009 when my daughter gave me a book about soap making. I started making my own soap, because the products available in the stores contained too many chemicals. After a few years I wanted to try developing a hand crafted soap that was affordable, made with ingredients that were sustainable, and gave the producer of the raw materials a fair price for their product. It has become evident through the process of trying to achieve an affordable, sustainable bar of soap, that we as consumers are not paying for the true cost of the products we consume. The environment is paying the price. The idea for the frogs came from my experience as a biologist, but likely started long before I knew what an ecosystem was. While growing up at a small lake in Pennsylvania I saw the impacts of our actions directly on the lake we played in and around. Each septic system for each house around the lake was draining into the lake. 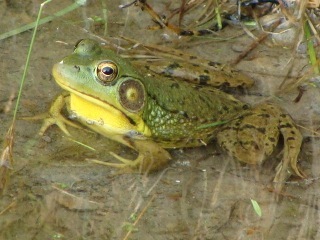 As the lake became polluted the call of the bull frogs on hot summer nights nearly disappeared. The lake now has a sewer system and the lake has recovered, but I wonder if the frogs have. The impacts we have on ecosystems also became evident when I was in Costa Rica and saw the devastation of the clear cutting that was taking place in order to plant mono cultures of crops, or for use in grazing cattle that were being consumed by developed countries. When I went to the Himalayan Mountains recently I saw plastic refuse not only in the environment, but in every waterway, including those at 12,000 feet in elevation. I have always been very interested in wetland biology and tropical ecosystems. What we do to our water systems we do to ourselves and future generations, and the frogs are the first to tell us when we have polluted our water. Without clean water all life will cease to exist as we know it. Hopefully this effort to educate the consumer will make a difference. We give 15% of our gross profits to help restore and protect habitat for threatened and endangered species. Thank you for visiting Fabled Frog Soap and for your support in the effort to make a difference for future generations. Our mission is to provide an environmentally responsible and sustainable product, doing no harm and supporting ecological systems, while meeting the human need to cleanse and nourish the skin. We use high quality, organic, fair trade ingredients when possible, researching each ingredient, and are committed to using deforestation free products that do not contain endangered or threatened species. We give 15% of our profits to Endangered Species International for the restoration and preservation of wildlife habitat. We are particularly interested in the preservation and restoration of frog habitat. Frogs are like the canary in the coal mine. They are one of the first species to show genetic mutations, have challenges with survival when an environment is polluted, and are often the first to disappear. Please visit our featured frogs within each product page for more information about endangered and threatened amphibians. To subscribe to our periodic product news & company updates simply add your email below. A confirmation email will be sent to you!